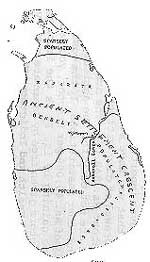 The development and distribution of the Ancient Hydraulic Civilization of Sri Lanka is reflected in several maps where the spatial distribution of ancient irrigation structures, the distribution of epigraphical stone inscriptions; the distribution of tribal settlements, capital cities/towns indicated by Ptolemy disbursed in our country. This synoptic study indicates to us that the densely populated areas were located in the Dry and Intermediate climatic Zones; while the Wet zone and the Arid zone in the north were sparsely populated. Map I indicates this distribution which takes the shape of a Crescent very clearly. For this reason I have called it the Ancient Settlement Crescent of Sri Lanka. Ruhuna forms the Southern section of this ancient settlement crescent and is separated by the Mahaweli Ganga. The word City in this presentation is used to indicate a tribal city or principality in the Greek/Latin Tradition, while it also includes the Capital or Principal City from which the King reigned. Some of the Lost Cities that have been identified are those that existed in Ruhuna from the B.C. period up to the 13th century with the fall of the Hydraulic Civilization, with the change in the river course of the Mahaweli Ganga in the first half of the 13th century due to a geological cataclysm, which resulted in a large segment of the population shifting to the Wet Zone in the Southwest quarter of the country as well as to the Arid Zone in the Northern parts. (1) Stone inscriptions found in situ from the B. C. period. (2) Ptolemy's Taprobane mathematically corrected by me ca. 110 A.D. which contains information of cities and their tribal affinities, while the rivers were named after them, the large tribal areas settled by them. (3) the chronicles and other published material of the post 4th centary A. D. period. (5) Archaeological ruins and other related monuments, including ancient irrigation works from the B.C. period to the 12th century A. D., which provides us with evidence in situ. (6) Scientific methods and techniques of coastal hydraulics, coastal geomorphology and remote sensing techniques were also used to locate some of the important ancient cities mentioned in the chronicles. (7) The results of numerous field visits and observations to the area by the author were also further made use of. Locating places mentioned in ancient chronicles is not an easy task. Where there is no scientific way of locating them on the ground except on the basis of physical evidence of stone inscriptions in situ or other archaeological evidence: often their locations have been based on informed gushes depending on the knowledge of the interpreter, but have not always stood the test of time. Today with the development of Science and Technology specially after the Second World War; archaeologists have to base their findings not only on historical evidence but also on the available new scientific tools and techniques. Chronology also plays an important role in not only being used for dating the location, but also for studying the stategraphy, development and evolution. While locating places based on etymology may not always be definitive. Locating places using ancient maps especially those of Ptolemy that provides us with coordinates is location specific and also relates to the time period ca. 110 A.D.
We have also noticed that sometimes there are several locations with same name contemporaneously and that the name of a place has changed with time. Thus one has to be very careful in giving the location of a place name that would be relevant to a specific period of history, otherwise this would result in confusion; as is seen in the location of places like Vijithapura, Nagadipa, Kelaniya, Magama of the B.C. Period. (a) Those existing in circa 5th centary B.C. as mentioned in the chronicles. (b) Those existing in circa 3rd centary B.C. with the arrival of the sacred Bodhi tree as mentioned in the chronicles. (c) Those mentioned as existing in circa. 110 A. D. by Claudius Ptolemy in his Taprobane which has been mathematically corrected by me in respect of its coordinates. (d) I have also included important places mentioned by Idrisi in his Serendib in 1150 A. D. in respect of Ruhuna as well. In addition to the recorded evidence from stone inscriptions, I have also made use of recently discovered archaeological sites and other new data using modern science and technology, including my field verifications of most sites in identifying these sites and locations. Over the last several decades in the course of my official duties and the special interest in them I have also made several private visits to these areas at my own expense to satisfy my curiosity. (3) Some important cities and townships mentioned in the 6th cent B.C. in the Mahawamsa related to Ruhuna. It has been recorded in the Mahawamsa that Vijaya after overcoming the yakkhas dressed himself like a Yakkha King. While there have been regions like Mahiyangana, Nagadipa, Kelaniya associated with the said visits of the Buddha in the 6th century B.C. period. There are also specific places that have been associated with folklore in these regions, where cetiyas or dagabos have been built to commemorate the said visits of the Buddha. These specific traditional locations have sometimes been renovated by Kings, which have also been recorded in stone inscriptions. Further evidence has sometimes been available from tradition among the people and supported by archaeological evidence. There is also been recorded events connected with the arival of the brothers of Princess Bhadda Kaccana in the time of Panduwasdeva in ca. 500 B.C. 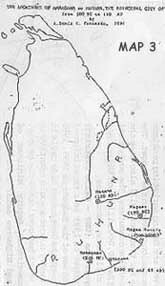 and their settlement at Magam Nuwera. There is also the recording of the participation of the Candanagama and the Kataragama Ksatriyas in the celebrations connected with the arrival of the Sacred Bodhi tree from the port of Jambukola that took 5 days of travel to Anuradhapura. 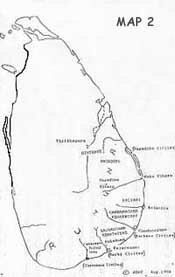 Map 2 indicates the location of the lost cities of Ruhuna mentioned in the 6th to the 3rd centuries B.C. 4. Magam Nuwera/Magama/Mahagama. (1) Magam Nuwera on Sudhodana Sakya Kumara the brother of queen Bhaddhakaccana mentioned in the Rajawaliya at Kumana in circa 400 to 260 B.C. (2) Mahanaga's Mahagama on the left bank of the Walawe ganga in circa. 246 B.C. mentioned in the Mahawamsa. (3) The Magama of Gotabaya near Tissamaharama in circa 200 b.C. known to most of us and identified by Henry Parker nearly 100 years ago. (4) The Mahagama of Kavantissa in circa 170 B.C. close to Lahugala. (5) The principal City or Magama near Tissamaharama as mentioned by Pliny in Circa 65 A. D. was virtually the same site as was in the time of Gotabaya, which was once again reoccupied and as stated earlier identified by Henry Parker. (6) Utara Maharajas Magrammum Regia as indicated by Ptolemy near Uraniya/Bibile area there is a place called Mahagama. Finally I would like to acknowledge in particular the pioneering work of erudite scholars like Hugh Nevill, Henry Parker, Prof. Senerath Paranavitana, R. L. Brohier, C. W. Nicholas and Dr. P. A. T. Gunasinghe whose findings and contributions I have relied upon including the Mahawamsa, as well as that of Claudius Ptolemy the oldest source which I have used. The extensive information in the topographical sheets produced by the Survey Department provided us with specific locations.